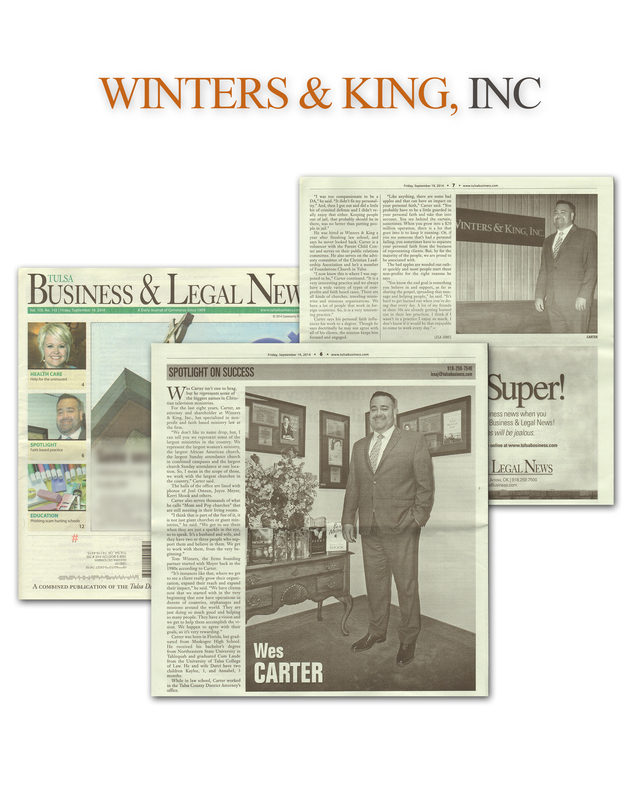 Wesley R. Carter - Our Attorneys - Winters & King, Inc.
Attorney Wesley Carter is a shareholder at Winters & King and a valued member of its extensive practice in nonprofit organization and business law. Mr. Carter also heads the firm’s intellectual property practice and handles a wide range of trademark and copyright matters. He has had multiple articles published on the subject in a variety of mediums. He frequently lectures at religious conferences and teaches legal courses at seminaries and missions schools. He, along with the rest of our team, represents and advises numerous highly respected churches, ministries, charities and other organizations across the United States. Mr. Carter handles a wide range of legal issues for businesses, including contracts, trademark issues, employment law and Internet law. 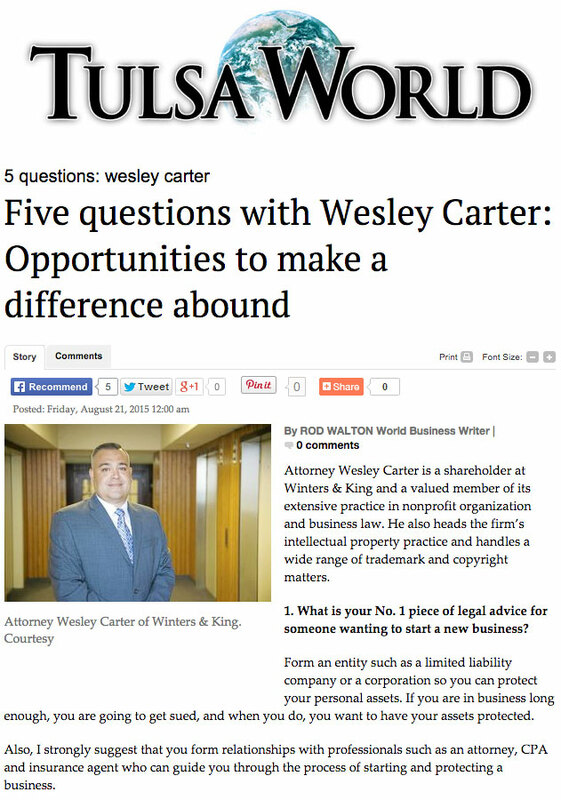 Attorney Wesley Carter has had an academic and professional career marked by excellence and success. 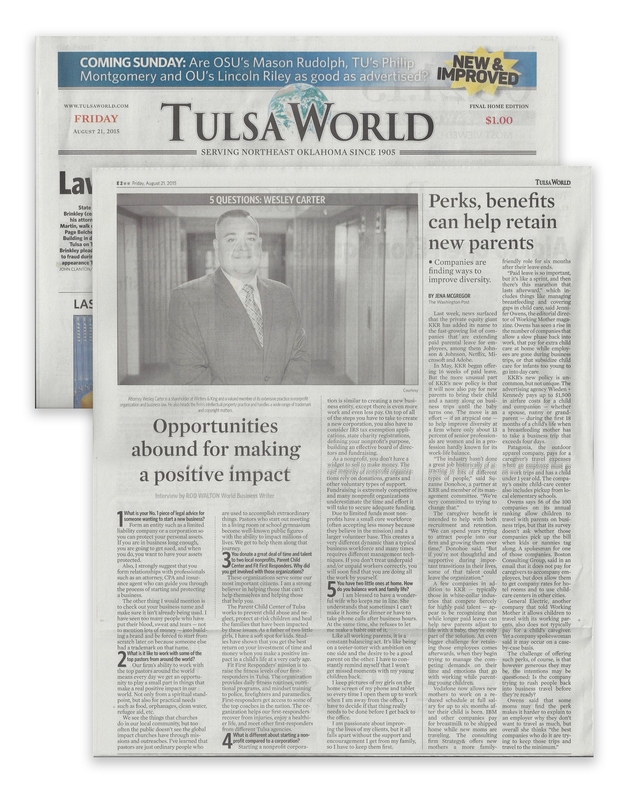 As a law student, he received numerous accolades for academic excellence, served as an editor of the Tulsa Law Review and worked on the Felony Team at the Tulsa County District Attorney’s Office. He graduated with honors from the University of Tulsa College of Law before being admitted to the Oklahoma bar. Every case is different and requires unique skills and experience. Our staff includes attorneys with experience in various aspects of business law, including employment, contracts, trademarks and Internet law. Our principles guide every area of our practice, and our clients appreciate and value this unique approach. Call us today at 918.494.6868 or contact us online to schedule a consultation regarding your legal issue. You can count on our values as well as our professionalism and competence.